Since 1981, Iris Kaplow Landscapes has been a full-service design, installation, and maintenance firm. The gardens and terraces of our private clients have often been featured in national and international publications. Our commercial clients have included some of the most prestigious apartment buildings in NYC. The fashion district along Broadway and Brooklyn’s Willoughby Plaza have benefited from our designs and services, becoming unexpected havens tucked away from urban chaos. Integrating color and texture with our knowledge of history and the needs of both indigenous and exotic plants, Iris Kaplow Landscapes can create your dream city or country oasis away from the outside world. Spanning the Tri-state Area and east to the Hamptons, Iris Kaplow and her team will meet with you to discuss how your ideal vision for the perfect garden retreat can be transformed into a reality. A landscape design and build practice based in New York City creating bespoke gardens and landscapes for properties large and small within the Northeast. These landscapes are urban and residential gardens, large suburban properties, college campuses and public spaces. We offer our clients project management and installation of these landscapes. Additionally, we support our clients with long term oversight of their landscapes to insure their lasting beauty. We believe that every landscape and garden design is a custom job. Each site is distinctive. The design process is a very personal, collaborative process between client and designer. Our mission is to increase the quality of life for our clients (and user of the space) by creating functional and sustainable landscapes that are ecologically responsible as sensorial spaces. Todd Haiman received his graduate degree with a Master of Science in Landscape Design from Columbia University. Additionally studying at the New York Botanical Gardens within the School of Professional Horticulture and Landscape Design. Mr. Haiman is a member of APLD (Association of Professional Landscape Designers), Royal Horticultural Society, Metro-Hort, ASLA and AIA. A design for a residential garden in Brooklyn, NY was selected for the “Suburbia Transformed – One Garden at a Time” award and exhibition created by the James Rose Center for landscape architecture research + design, sponsored by Garden Design magazine. 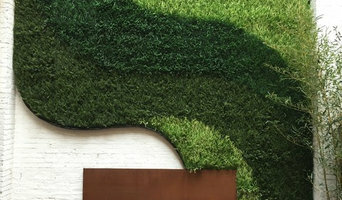 In past years, his work was featured in the 6th annual European Biennial of Landscape Architecture in Barcelona, Spain. His "Reading Rooms" design was included in an international exhibition on Vertical Gardens, subsequently featured at AIA San Francisco. As part of a small team from Columbia University, Todd received a grant from the NYC Department of Parks to rehabilitate an underused park in upper Manhattan. He has also served on a think tank for NYC2030 – Re-envisioning 23rd Street. Todd Haiman was born in Brooklyn and presently resides in NYC. Christian Duvernois Landscape endeavors to create environments tailored to a unique vision. They commit to individual client-based requirements and acknowledge the importance of the clients vision. By filtering these core values through a rigorous process of spatial, aesthetic, and technical exploration, CDL/S delivers memorable and lasting places. CDL/S formulates adaptive strategies to accommodate a natural evolution of all designs. A feature of CDL/S’s design approach is a sensitivity to site constraint and material application. It is CDL/S’s belief that creating environments that allow for regular use, changing seasons, variable weather, and future growth is a critical component in the creation of compelling spaces. CDL/S’s design approach is also characterized by the expansion of the role of the traditional artist. Christian Duvernois Landscape/Studio looks beyond the realm of the conventional and uses specialized artists to generate site-specific pieces. By engaging artists in the creative process, the overall design concept is transformed and the experiential quality of the space is enhanced. A Landscape Design & Build Contractor for over 25 years. Like anything else in life, it comes down to the tried and true relationships we create with people. Leading with an unmatched zeal for my work, I seek to use a superior base of Horticultural and scientific knowledge, blended with a down to earth and open communication style. The final intent is to wind up with an utterly unique style that enhances both the relationships I create with, and the end results I obtain for my clients. I David C. Freeman/DC Freeman LLC listen to YOU! DC Freeman LLC offers hands on, personal, individualized solutions for your landscaping needs. For City and Country, both. With more than 25 years in the business, I've earned a reputation in the Tri-State area for my depth of knowledge, creativity, ethics, and punctuality. Your visions, my own, or ideas that we'll create together. I concentrate on what I do best, primarily Residential Design. I endeavor, through depth of communication, to help you create artful, useful, outdoor spaces that suit your lifestyle. I understand the difference between Monet & Manet, Rousseau & Rembrandt. Through education, sweat equity, and years of streamlining our processes, we deliver top of the line results. Today I run a successful company, write articles for Horticulture magazines and take part in professional organizations to better the face of the industry I love. But this began long ago. Learning at the feet of my Dad, an Appellate Court Judge, for whom ethics and gardening held the same importance, I was immediately hooked. Mom took us to museums, and ALWAYS the twain shall meet. I knew early on what my goal was; to excel as a Landscape Design/Build Contractor. Through years of working for other mentors, a voracious reading habit, including vigorous study at Rutgers and Cornell, I grasped, and continue to, every tool possible, to excel at the job I love, building outdoor living spaces for people. DC Freeman LLC also provides regular work for several charities and community needs. But we do not seek accolades. Plants and people, both require listening and nurturing to thrive. I seek to feed my base of knowledge on a daily basis. If "I'm the smartest guy in the room"? I go look for another room. Tired of unreturned calls, failed promises? Call us! This is not "just a job" for me. This is my life. As are my clients. My name means something to me. I want it to mean something to you. Beautiful and practical outdoor surroundings are in reach of everybody. I believe every property can gain dignity, usefulness and serenity through thoughtfully crafted design that includes the right plantings and imaginative detailing. We will work closely in the creative process to realize your vision. Together we will develop your own special domain using my technical skills, fresh ideas and hands-on experience. You certainly can have gardens bursting with colorful flowers and butterflies (and food), four season beauty, well constructed hardscaping, and dramatic curb appeal. The Crafted Garden seeks to design and install landscapes which stay on budget, honor the land, and satisfy the wishes of our clients. We will work together to find create an outdoor sanctuary which respects the realities of the land. Each design choice should add value to the senses and also to that of your real estate - in all four seasons and on into maturity. Every property is different and specific, every client unique, and every design a challenge. That’s the fun of it all. Three decades ago, a vision was followed and fulfilled by two brothers, Herbert Ehrich, Jr. and Lothar Ehrich. We now offer our prospective clients full design/build services, with gardens, terraces, courtyards/motorcourts, custom swimming pools, ponds and unique garden follies custom carved of Granite, Limestone and Marble. Organic vegetable farmers and founders of Paradise Organic Farms, Lothar and Herbert use their profound love and knowledge of the earth to aid them in designing and creating exterior spaces that previously only existed in their clients' dreams. Ehrich & Ehrich's Design Center, reminiscent of the Orangerie at de Bois de Boulogne, of Paris, France, is the perfect home for our international design staff. Located in a kaleidoscope of gardens on our 210-acre nursery and organic vegetable farm, this former “Plant Palace” provides a perfect setting for client and designer to dream. Whether it is to design/build your new home; create a landscape to complement your new home; rejuvenate an existing home and landscape; or to embellish what is in place now, our full service design/build capabilities are waiting for you. The work of this outdoor professional includes most everything surrounding a home's exterior. A landscaping architect can even work with the home architect to choose the right spot for your Manhattan, NY house. From there the Manhattan landscaper will develop preliminary concepts for your front or backyard design based on individual needs including the climate and activities that will take place, as well as layouts and planting plans. Landscape architects will also design any structures or outbuildings that will be added to the space. Any grading changes that will be added to the yard are also the responsibility of the architect. This includes any drainage modifications. An engineer can also be responsible for these tasks, but licensed New York landscapers are fully capable. Like building architects, they will produce preliminary concept drawings as well as detailed construction documents and planting plans. Three-dimensional renderings and illustrative plans are all supplementary. A Manhattan landscaping designer generally will have ecological, aesthetic and technical training, which helps them maximize the potential of your outdoor space. Keeping in mind both style and functionality, garden designers analyze your architecture and yard to produce a plan that may or may not include location and materials for walkways, patios, water features, fences, garden aspects and more. In addition, a landscaper in Manhattan, NY will carefully assess your geographic region to choose plants, trees and flowers that will flourish naturally, as well as address concerns such as drainage, screening and soil conditions. Certain landscape designers only help with the planning portion, while some may deliver the plans and then oversee a hired landscaping contractor. Others — typically following a design-build approach — take care of both the design and all aspects of the landscape architecture and construction. Before you hire a New York professional landscaper, consider the scope and emphasis of your outdoor project. Landscape architects, who typically hold advanced degrees in their field, are trained to develop comprehensive structural plans that include plants, hardscaping, water use, drainage and more. Landscape designers typically specialize in the aesthetic and horticultural, rather than structural, side of yard and garden planning. They might or might not have advanced training. Even within their fields, a garden designer may specialize in hardscape- or vegetation-focused designs. In some cases you might need to hire additional help to get the outdoor space you want. Here are some related professionals and vendors to complement the work of landscape architects & landscape designers: Landscape Contractors, Garden & Landscape Supplies, Tree Services, Gardeners, Lawn Care & Sprinklers, Decks, Patios & Outdoor Enclosures. 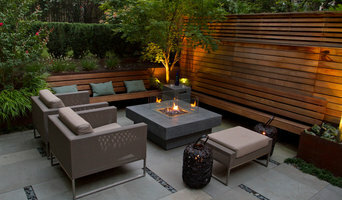 Find a Manhattan landscape architect on Houzz. 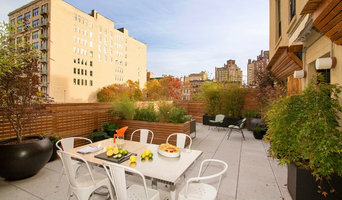 Narrow your search in the Professionals section of the website to Manhattan, NY landscape architects and designers. You can also look through Manhattan, NY photos to find a space you like, then contact the professional who posted the photo.